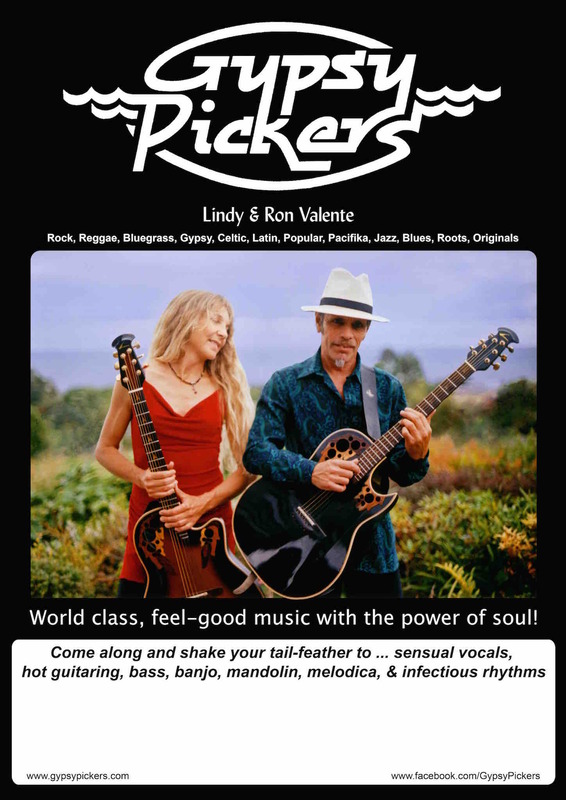 The Gypsy Pickers have a captivating show with music to move you and make you move - with rock, reggae, bluegrass, popular, celtic, latin, pacifika, blues, jazz, roots, and more. For a night of floor-shaking dance music or a quality concert experience, the Gypsy Pickers are known for consistently pleasing crowds of all ages. Punchy on hot guitars, bass, banjo, mandolin, melodica, percussion and rich vocals, the duo never fail to get a room's energy moving! Their infectious rhythms, virtuosity and a vast repertoire, have made them one of the South Island's busiest long-time live acts. Their crowd-rocking jams are legendary. 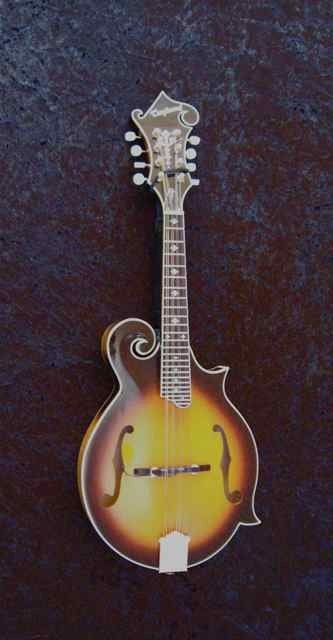 Ron is an exceptional lead guitarist, who plays with a joyful and inspiring spontaneity, and he doubles up on mandolin. Lindy sings with a grace and fire that moves effortlessly through a wide range of styles and she's a talented guitarist and multi-instrumentalist. These two have an intuitive chemistry between them that creates an uplifting electricity. They have a mutual attraction for wowing the crowd with a bit of raucous fun and musical wizardry on banjo and mandolin, along with other surprise instruments. Ron was born on Route 66, Flagstaff Arizona. Early in his career he was guitarist and songwriter in an all original rock band in LA. He went on to tour the USA with blues man Buddy Reed (guitarist for Little Richard and other blues greats). He came to live in New Zealand in the 1980s and featured on regular shows of TVNZ's That's Country where he performed with a long list of top international artists including Emmy-Lou Harris and the Flying Burrito Brothers. It was around this time that Ron discovered the South Island's West Coast and wrote his legendary song 'West Coast Bound' which features in the movie 'Magik and Rose' and has become the theme song of the famous West Coast Wild Foods Festival. At a South Island music festival Ron met Lindy - a kiwi songbird who had been performing as a solo artist in Australia. They became the Gypsy Pickers (aka The Valentes) and have toured extensively in New Zealand, Australia and in the USA. The Gypsy Pickers have shared the stage with many top NZ performers. They've featured on TV shows and their original music has received regular radio, internet and TV airplay. The Gypsy Pickers have recorded with electronic artist Max Maxwell - collaborating on tracks which have been included in bfm award nominations - and with various other artists including The Warratahs and The Coalrangers. "Whether you like to kick up your heels and have a good time or just sit back and listen, the Gypsy Pickers are an exceptional live touring act not to be missed!" For a historical profile of the Gypsy Pickers visit Audio Culture, NZ music site.
" Thankyou so much for your amazing music at our wedding. You were absolutely amazing and knew how to get the guests up and moving. We will definitely recommend you in the future!" "Thank you so much for playing at our wedding. We had so many comments on how great you guys were and everyone loved it. We can not thank you enough as the music adds a huge part to the day, so a big THANK YOU. We will not be hesitating in recommending you to friends." " Just wanted to quickly touch base again to thank you so much for such a great performance last night! You guys did such a good job! You really set the tone for such a fun night. We received so many good comments and people asking how they could get ahold of your music! Thank you so much again." "Thankyou for your lovely music and the great energy you contributed to our wedding. The dance floor was always packed which speaks for everyones enjoyment!" "THANK YOU FOR THE MUSIC, FOR GIVING IT TO ME!" on my birthday! What a FABULOUS night we had. I think it was my best birthday ever. We all LOVED your music"
"We wanted to say thank you for your energy and good times! Everyone raved about how much fun the band was & what a terriffic time they had! Spot on with choice of music and timing etc. Cheers for working in with the couple of requests! Your energy & passion for music was magnificent! Thank You - very much! If need testimonials etc, please feel free to shout!" "We were at the Wine & Food festival yesterday and we got such a buzz listening to your music! You sounded great and we can't wait for you to play at our wedding!" "Just wanted to give you both a very big thank you for Saturday night... You were fantastic, we had lots of great comments and I would highly recommend you." "However music organiser Co Ham had saved the best till last when on the Sunday night he introduced us to a new local duo the Gypsy Pickers who dazzled us with their energy and brilliant technique. 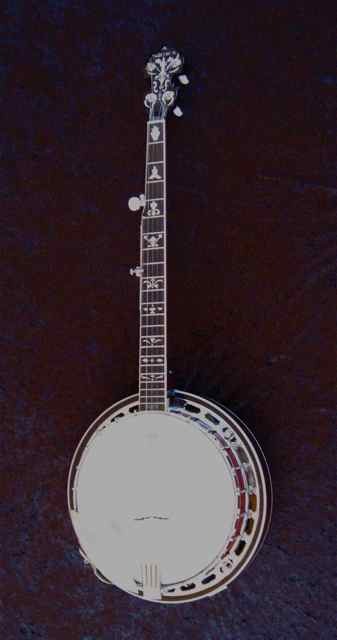 I have never heard 'Duelling Banjos' played wlth such electrifying intensity. At 10pm after three hours of intensive playing none of us wanted them to stop. You could feel the love!" "The Gypsy Pickers are coming. They are playing here this Friday the 21st. Get ready to be amazed. They are playing from 8.30 so get here early to get a good spot. ."
"We were very happy with how everything went especially the music, it really made the party. Thanks again, you guys are a class act!" "Lot's of people have asked who the band is and we've had some great comments when we've mentioned your name. Can't wait!" "... was hearing The Gypsy Pickers which was such an amazingly energetic performance and a good choice of songs to get everyone going. Seeing you both perform was a great way to spend our evening. We will have to keep checking your website to see when you might be performing up this way again!! " "Lindy I really appreciate all your communication, it makes things easy and has been a big help with organising things." "A bit scared (booking a band) sight unseen. But a brilliant job! Thankyou." "Interested in getting a great band for your entertainment? I can recommend the Gypsy Pickers for a fun night!" 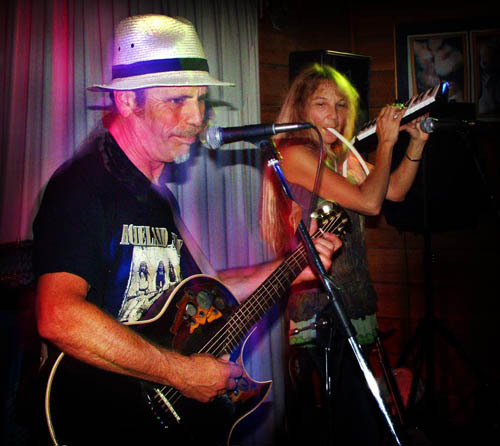 "The Gypsy Pickers are an acoustic duo who love live perfomance and it shows as the verve and vigour they play with is guaranteed to get people up and dancing. ...at a Gypsy Pickers concert (you can) expect to hear their own originals plus covers of everything from rock to reggae, blues to bluegrass, cajun to calypso - all given the treatment by the pair which can sometimes lead to floor-shaking spontaneous jams." "The Gypsy Pickers have opted to put on ice an offer to tour Europe from a promoter who handles Sting, Jethro Tull and other mega-concert acts, to remain in Far Northern Queensland at least until October. 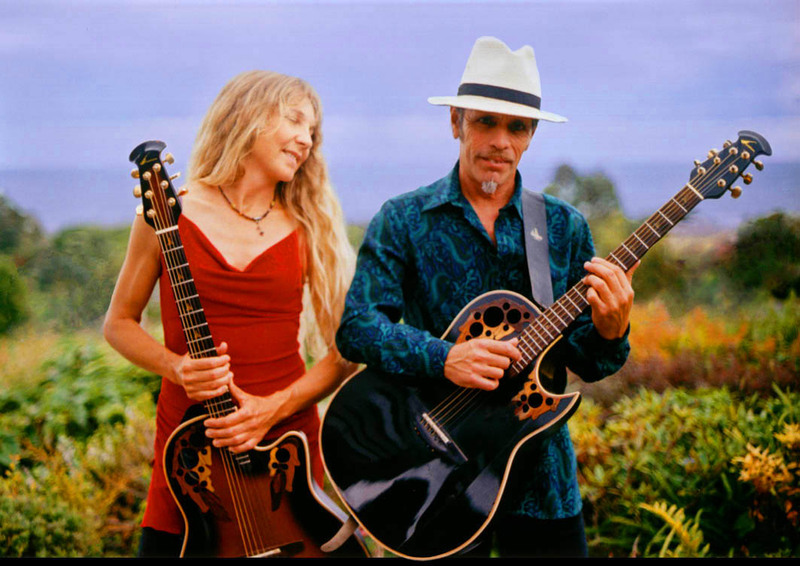 That's good news for Port Douglas music-lovers, who have taken the acoustic duo to their hearts." "Michael Gabour's Court House Hotel at Port Douglas has been named Queensland's 'Best Entertainment Venue' in the 1996 Australian Hotels Association American Express National Awards for Excellence. ...This week's entertainment at the Court House ...the Gypsy Pickers." "When local duo the Gypsy Pickers play here, the place bursts its macrocarpa seams." "Ron and Lindy Valente must be very happy with this new CD...it's an absolute gem." The Gypsy Pickers are well known for their class act as a high-energy music duo available for venues, festivals, weddings, conferences, events and private functions. They perform all around NZ. Both are also available as solo performers. LINDY VALENTE Solo artist: Be mesmerised, sing, dance and be entertained by this well-travelled and talented musician. 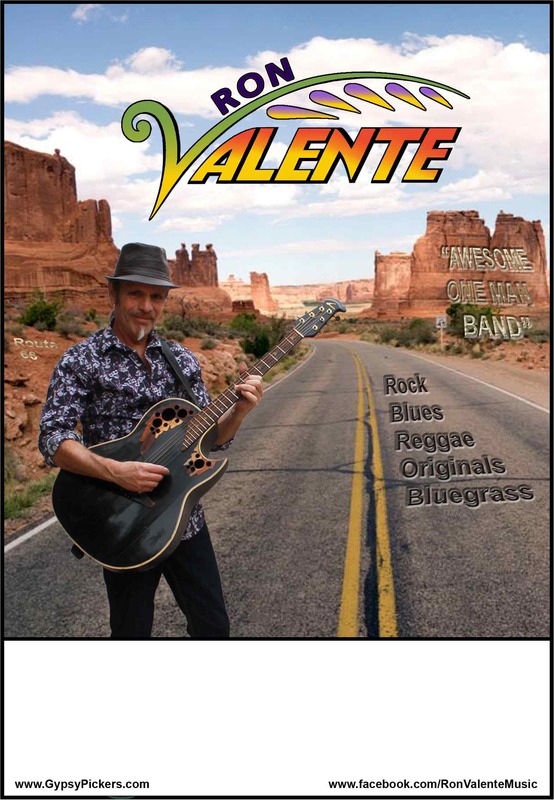 RON VALENTE Solo artist: A high energy live act and versatile one-man-band. PAINTINGS: Ron is also a visual artist, specialising in gorgeous scenes from the forest and coast of Abel Tasmal National Park. Here's a sample repertoire of some of the songs we perform, depending on what's suitable for the occasion. The Eagles, Jason Mraz, Adele, The Police, Mumford & Sons, Ed Sheeran, Van Morrison, Stevie Nicks, Johny Cash, Bob Marley, The Pogues, The Beatles, Fleetwood Mac, Ben Harper, Bob Dylan, CCR, Old Crow Medicine Show, Norah Jones, Steve Earl, Pharrell Williams, Simon and Garfunkle and many more.